You can earn 1995 yards with this purchase! The first personal launch monitor of its kind, SkyTrak is a realistic and real-time golf practice and play system. 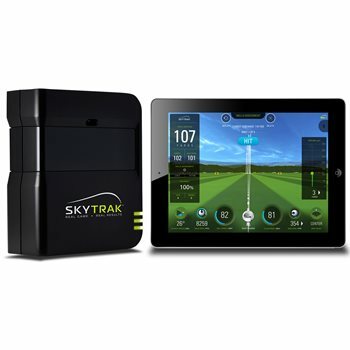 SkyTrak connects wirelessly to your iPad or PC, then accurately captures and displays launch data and ball flight as soon as you hit the ball. You’ll see the ball fly and receive instant feedback on every shot. Now you can tee it up rain or shine, 365 days a year, without a tee time, in the convenience of your own home! Practice: SkyTrak provides immediate and detailed feedback you need in order know the strengths and weaknesses of your game. Features include Ball Speed, Launch Angle, Back Spin, Side Spin, Side Angle, Spin Axis and Total Spin. Challenge: Choose from several single or multi-player challenges such as closest to the pin, target practice, and long drive. Play: Swing away with SkyTrak to play famous 18-hole courses on WGT Golf with your own clubs and own balls at your own pace virtually anywhere! What is needed to completely set up the skytrak?